A motorcyclist travelling on a B class road came across a bus travelling in the same direction. The bus driver signalled his intention to turn left. The motorcyclist overtook the bus as it turned left from the main road into the minor road. 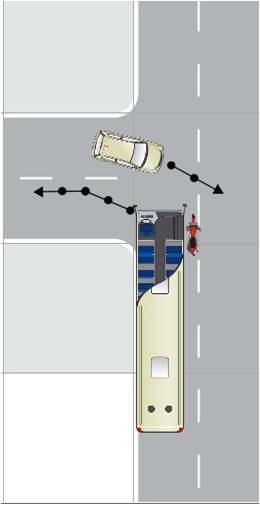 A car driver waiting at the junction to turn right saw the left-hand indicator of the bus and pulled out into the path of the motorcyclist. Held on appeal that the car driver should have waited to let the bus get completely into the minor road before pulling out because there was always a possibility of a vehicle, particularly a motorcycle, being masked by the bus.